Franz Kafka Hostel i Prag, Tjekkiet: Reservér nu! 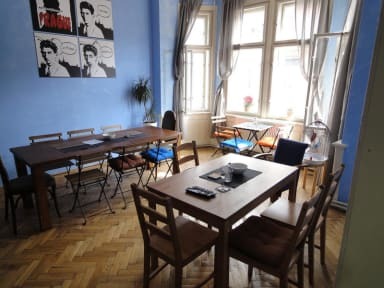 Hostel Franz Kafka is situated in the centre of Prague, in the street Kaprova. The location of the hostel is the most lionized area by the Czech and foreigners tourists. Have you ever imagined that after waking up you can have your breakfast few steps from your room at Staromestske namesti. If you like it, you can make your dream come true. In the closest neighbourhood you can find the most wanted historical monuments, boutiques, restaurants as well as bars and discotheques. The astronomical clock Orloj on the Old Town Square, Hebrew cemetery, exclusive Cuban restaurant and the bar La Bodeguita Del Medio and the well-known party club can't be forgotten. In case if you would come late please let us know and we will open to you reception. Check in after 2pm till 8pm if you arrive late please contact us by email or by tel.